Abuja, Nigeria. August 19th, 2014 - Latest weekly poll results released by NOIPolls Limited have revealed about 7 out of 10 adult Nigerians (72%) are not confident in the capacity of their local hospitals to provide the needed care and manage patients with the Ebola virus. The poll further revealed that 82% of those polled are currently more concerned about the Ebola virus disease than other infectious diseases such as HIV (8%) and hepatitis (3%); while the vast majority (91%) of respondents are aware of the recent outbreak of the viral disease. More findings revealed that 80% of Nigerians expressed concern over the spread of the virus in Nigeria, with just over half (57%) of the respondents having confidence in the Federal Ministry of Health and its agencies to protect Nigerians from the impact of the virus in the event of further spread. These were the key findings from the Ebola Virus Disease Poll conducted in the week of August 11th 2014. Ebola virus disease (EVD), previously known as Ebola haemorrhagic fever is a serious, often fatal illness in humans with a fatality rate of up to 90%. Current knowledge is that EVD outbreaks are started when the Ebola virus is introduced into human populations through close contact with the blood, secretions, organs or other bodily fluids of infected animals such as chimpanzees, gorillas, fruit bats, monkeys, forest antelope and porcupines found ill or dead or in the rain forest1. Ebola then spreads in the affected community primarily through human-to-human transmission, with infection resulting from direct contact (through broken skin or mucous membranes) with the blood, secretions, organs or other bodily fluids of infected people, and indirect contact with environments contaminated with such fluids. Burial ceremonies in which mourners have direct contact with the body of the deceased person present a particularly large risk for the transmission of Ebola. The Ebola virus was first imported into Nigeria by the late Liberian-born American, Patrick Sawyer, who arrived in Lagos on the 20th of July 2014 and died five days later after being diagnosed with the Ebola virus at First Consultants Hospital in Obalende in Lagos State. 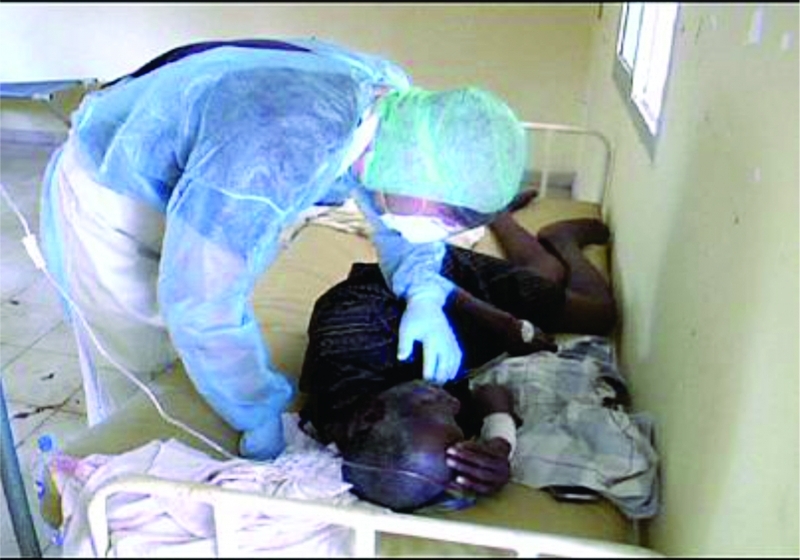 By the 17th of August 2014, 26 days after the emergence of Ebola in Nigeria, the Federal Government of Nigeria has confirmed 169 people under surveillance, 6 cases of undergoing treatment and 4 deaths. Major concerns about Ebola in Nigeria include widespread fear of the disease, limited availability of the right public health education, the on-going doctors’ strike and subsequent sack or resident doctors in public sector hospitals, non-adherence to standard infection control protocols in Nigerian hospitals, lack of personal protective equipment for health care workers and the general poor sanitation practices across the country. Against this background, NOIPolls, in collaboration with EpiAfric, an Abuja based Public Health consulting firm, conducted a poll to seek perceptions of Nigerians about Ebola. The poll aimed to gauge awareness of the outbreak of Ebola Virus Disease (EVD); assess the degree to anxiety of Nigerians should the disease spread further in Nigeria; measure the awareness of Nigerians on how the virus spreads; determine how informed Nigerians feel they are on how to protect themselves from the virus; measure the confidence of Nigerians on the ability of the Ministry of Health and its agencies to deal with an outbreak of Ebola virus disease; gauge public perception of the capabilities of local hospitals in managing cases of Ebola and identify how afraid of Ebola virus disease Nigerians are compared to some other diseases. Presented below are extract from the report, please click here for full report. Respondents were asked 7 specific questions; however, findings from only four questions are discussed below. To estimate the awareness of the Ebola virus disease, respondents were asked: Are you aware of the current outbreak of Ebola virus disease in West Africa? Ninety one percent of adult Nigerians surveyed acknowledged that they are aware of the outbreak of the virus in West Africa and this cuts across gender, geo-political zones and age groups. Furthermore, respondents were asked: How worried are you about the current outbreak of Ebola virus disease and possible spread in Nigeria? The responses show that 80% (61%+19%) of adult Nigerians were concerned about the spread of the disease in Nigeria, with, a total of 20% (14%+6%) of the respondents surveyed claiming that they are not concerned. Analysis across geo-political zones indicates that the North-East zone has the highest proportion (96%) of respondents concerned about the spread of the virus in Nigeria. This is closely followed by the North-West zone and the North-Central zone with 87% and 77%respectively. Respondents were also asked: How confident are you that your local hospital has the capacity to provide the needed care and manage cases of Ebola virus? Responses shows that the vast majority (72%: 47%+25%) of adult Nigerians are not confident that their local hospitals have the capacity to provide care and manage cases of Ebola virus disease, whereas, 28% (4%+24%) stated that they are confident that their local hospitals do have the capacity to care and manage cases of Ebola disease. Findings from the geo-political zone view shows that the North-West has the highest (42%: 52%+26%) proportion of respondents who indicated that they are not confident in their local hospitals capacity, while the North-Central zone accounted for the highest proportion of respondents who expressed their confidence in the local hospitals in managing the Ebola virus with 39% (9%+30%). Finally, respondents were asked: Of the following infectious diseases, which one are you most worried about? The result revealed that majority (82%) of Nigerians surveyed reported that they are currently most concerned about the Ebola virus disease than any other disease. This cuts across geo-political zones, gender and age-group. Notwithstanding, 8% of the respondents indicated HIV, 3% mentioned hepatitis while 2% stated other diseases. In conclusion, the poll results revealed that 91% of respondents surveyed acknowledged that they are aware of the recent outbreak of the Ebola virus disease and 80% of Nigerians are concerned about the potential for further spread in Nigeria. The North-East zone had for the highest proportion (96%) of respondents who are concerned about the spread of the disease in Nigeria. More findings revealed that Just over half (57%) of the respondents are confident that the Federal Ministry of Health and its agencies can protect Nigerians from the impact of the virus in the case of possible spread. The South-East zone has the highest proportion (65% i.e. 27% + 38%) of respondents who are confident that the Ministry and its agencies can protect Nigerians from the virus. The vast majority (72%) of adult Nigerians surveyed are not confident that their local hospitals have the capacity to provide care and manage cases of Ebola virus disease. Finally, our findings also showed that the majority (82%) of adult Nigerians are currently more concerned about the Ebola virus disease than other diseases such as, HIV (8%)and hepatitis (3%). Results are based on telephone interviews of a proportionate random nationwide sample, and conducted in the week of 11th to 15th August 2014. 1,006 randomly selected phone-owning Nigerians adults aged 18 years and above, across the six geopolitical zones in the country, were interviewed and the Interviews were conducted in English, Pidgin, Hausa, Igbo and Yoruba languages. With a sample of this size, we can say with 95% confidence that the results obtained are - within a range of plus or minus 3% margin of error of the views of the source population. NOIPolls Limited, No.1 for country-specific polling services in West Africa, which works in technical partnership with the Gallup Organisation (USA), to conduct periodic opinion polls and studies on various socio-economic and political issues in Nigeria. More information is available at www.noi-polls.com. This report has been produced by NOIPolls Limited in collaboration with EpiAFRIC to provide information on Ebola Virus disease in Nigerians. NOIPolls and EpiAFRIC hereby certify that all the ideas expressed in this document accurately reflect the answers provided by the respondents surveyed for the poll. Background information is based on information from various sources. Whilst reasonable care has been taken in preparing this document, it cannot be guaranteed that this report does not contain any errors. Any ratings, forecasts, estimates, opinions or views herein constitute a judgment as at the date of this document. If the date of this document is not current, the views and content may not reflect current findings and/or thinking of NOIPolls and EpiAFRIC.